Online shopping has never been easier. But the majority of American consumers want the tactile experiences offered by physical stores. Editor's note: The following is the first installment in Retail Dive's Consumer Survey, a six-part series examining the psyche of the American consumer and the evolving role of the brick-and-mortar store in the shopping journey. Check out all of our results on our landing page. Long live the brick-and-mortar store. Everyone knows online shopping has never been easier or more accessible. But despite the surge in e-commerce capabilities, mobile applications and other technology advancements — including voice-activated shopping and the proliferation of Amazon Dash buttons — the majority of American consumers still want the tactile experiences offered by physical stores. The ability to see, touch and feel products as well as take items home immediately rank highest among the reasons consumers choose to shop in stores versus online, according to Retail Dive's Consumer Survey. For the first question in a six-part series looking at consumer shopping habits, we surveyed 1,425 U.S. consumers via Google Surveys about the reasons why they choose to shop in stores over online. By a fairly wide margin, the primary motivation for shopping in stores is to see and try out products before purchasing. However, some notable differences exist among shoppers, depending on their gender, age and location. Shoppers at both ends of the age spectrum — younger and older generations — want to see or try products out in stores more than their middle-aged counterparts. Young shoppers clearly convey an “I want it now” mentality versus older cohorts. But while physical stores still hold primacy in the American shopping experience, 7% of respondents say online is the only way they shop — a trend expected to grow in the coming years. “To see, touch, feel and try out items” is the top reason why consumers choose to shop in physical stores versus online. With 62% of shoppers wanting to kick the tires, retailers must take full advantage and up their game to create compelling in-store shopping experiences. Shoppers also want it now and want it fast. 49% of consumers say they choose stores over the web because they want “to take items home immediately.” This suggests that next-day — let alone two-day — shipping cannot fully replicate the immediate gratification of buying products in store and taking them home. It's why speed to market and figuring out last-mile delivery expectations keeps retail executives up at night. One in five consumers cites easy returns as a key reason for shopping in stores versus online. Little wonder why Amazon has thrown down the gauntlet and now requires its sellers to offer free returns. Despite the robust e-commerce movement, roughly another fifth (18%) of consumers still seek the enjoyment — and likely social aspect — of going shopping in stores. The ability to ask store associates questions ranks fairly low on the list of reasons to shop in stores vs. online, however, and was cited by just 13% of consumers. Accustomed to having information at their fingertips and on their mobile phones, consumers don't seem particularly motivated to seek answers from store employees — or at least, it's not a good enough reason to go to the store. Retailers may need to rethink staffing requirements and how to best utilize people power. Maybe those robots aren’t such a bad idea, after all. 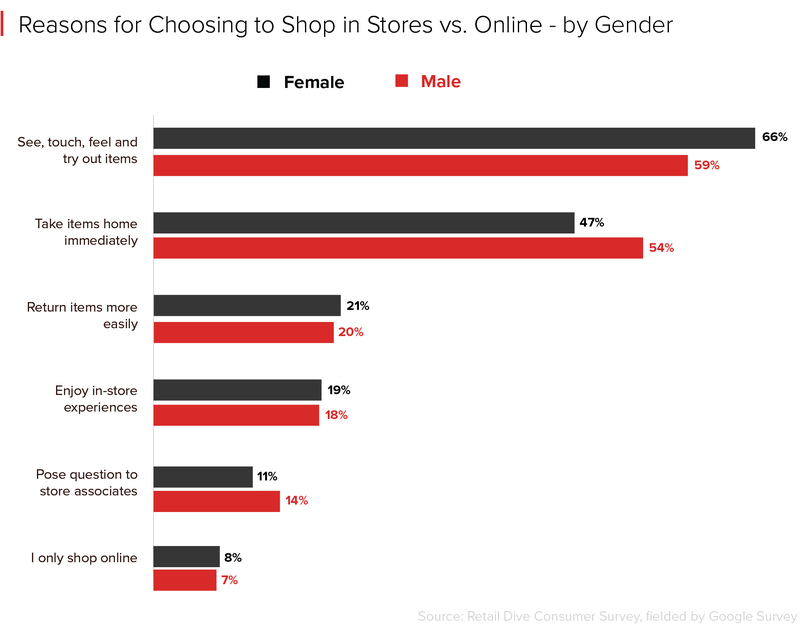 When breaking down the data further, significant differences exist between genders when deciding whether to shop online or in stores. From the female perspective, it’s all about the ability to see, touch and feel items. Two-thirds (66%) of female shoppers say trying-it-out is a deciding factor for shopping in stores versus online. Shopping for products with a high fashion quotient — think apparel and accessories or home furnishings — is a likely driver. While seeing or trying out products is the top-ranked reason given by males (59%) as well, instant gratification is nearly as important. A higher share of men (54%) than women (47%) say that taking items home immediately is why they shop in stores versus online. Compared with the average, a higher percentage of young (less than 35 years) and old shoppers (65+) cite the need to see, touch, feel and try out items as a primary reason they shop in stores. This appears to be indicative of age groups that have more time on their hands to go to stores and shop around. An interesting relationship popped up between age and instant gratification. Compared with older shoppers, a higher percentage of younger shoppers say they shop in stores to take immediate possession of items. For example: 62% of 18-24-year-olds cite taking items home immediately as a reason they shop in stores vs. online, compared with just 40% of shoppers aged 65+. The youngest age segment (18-24) also over-indexes on returning items more easily, enjoying the in-store experience and interacting with store associates compared with the overall consumer population. 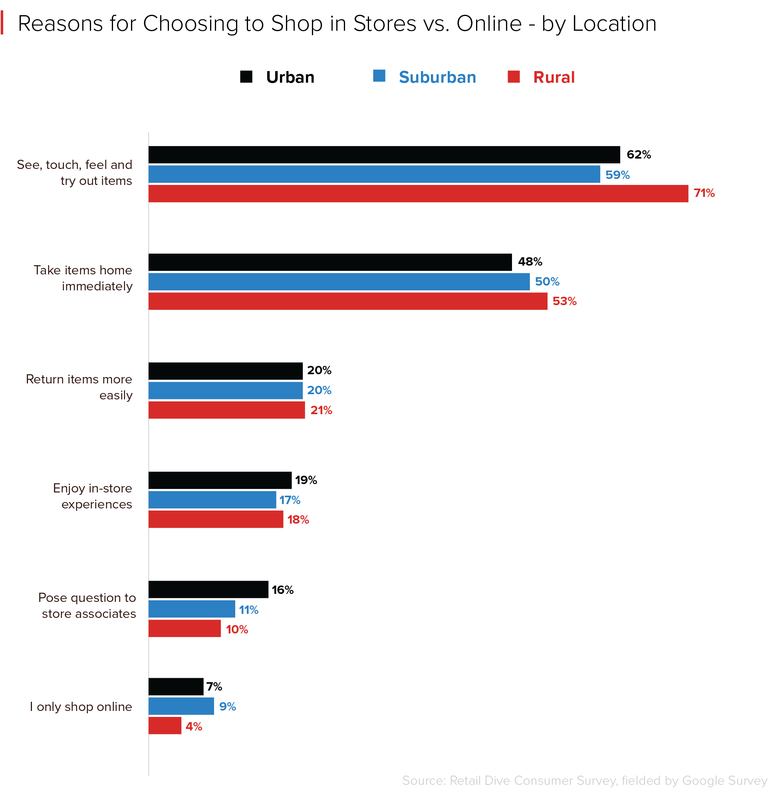 The key figure that stands out when looking across location types — urban vs. suburban vs. rural shoppers — is the low percentage of rural shoppers who say they only shop online (4%) compared with the 7% national average. Undeveloped or under-developed logistics and delivery infrastructures in rural areas likely come into play here. Conversely, a significantly higher share of rural shoppers (71%) say the reason they shop in stores vs. online is to see, touch, feel and try out items. Often needing to drive long distances to shop, rural consumers may well consider in-store shopping an event and a time investment, so they want to be sure to get the items right. Given the onslaught of online competition — and the attention and investment dollars being diverted to advancing e-commerce capabilities — it’s important for brick-and-mortar retailers to not lose sight of their physical store strategy. Brick-and-mortar holds an advantage for its ability to satisfy shoppers' needs to try out products and immediately take them home. A compelling in-store shopping experience where shoppers can easily see, feel and try-out products — coupled with stellar inventory management to ensure product is in stock — can make or break physical retailers. 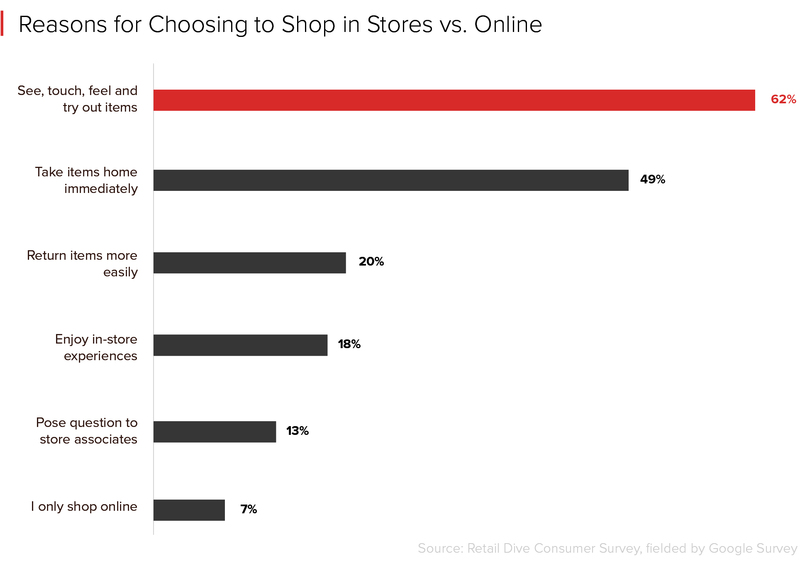 Stay tuned for the next part of the Retail Dive Consumer Survey series: a look at which product categories consumers want to shop for in stores vs. online. We'll be back.